Quality accessories for innovative drummers. The JC-1SC signature model cymbal mallets are designed to the specification of Jim Campbell, Professor of Music and Director of Percussion Studies at University of Kentucky, and Principal Percussionist with the Lexington Philharmonic Orchestra. These mallets are constructed with extra large, extra durable rattan, along with weighted rubber cores, resulting in a well balanced mallet that will bring out the true tone and fundamental of suspended cymbals. 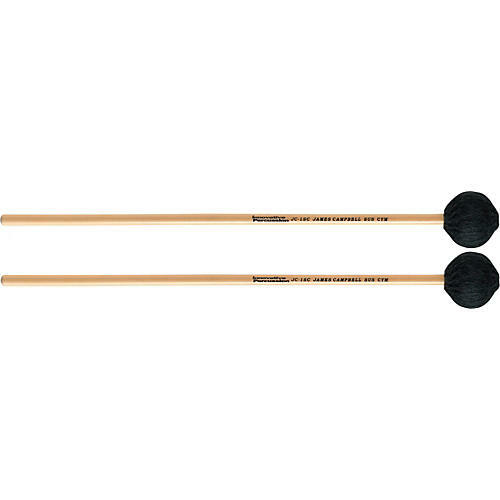 Jim's mallets are offered in two models of hardness for both articulate passages and rolls, and to accommodate different thickness and diameters of cymbals. The mallets are wrapped with wool yarn for a warm sound with no contact noise.